I think my husband was the first to try it—baked pumpkin slices. We all love pumpkin, but it can be a real pain to prepare—either you spend an hour baking whole pumpkins, or you peel and cube dangerously hard raw ones. These lovely slices, with the peel on, are easy to prepare and bake up quickly. They make a wonderful side dish with lentils or burgers (and probably go well with animal flesh, too, for the meat eaters among you). 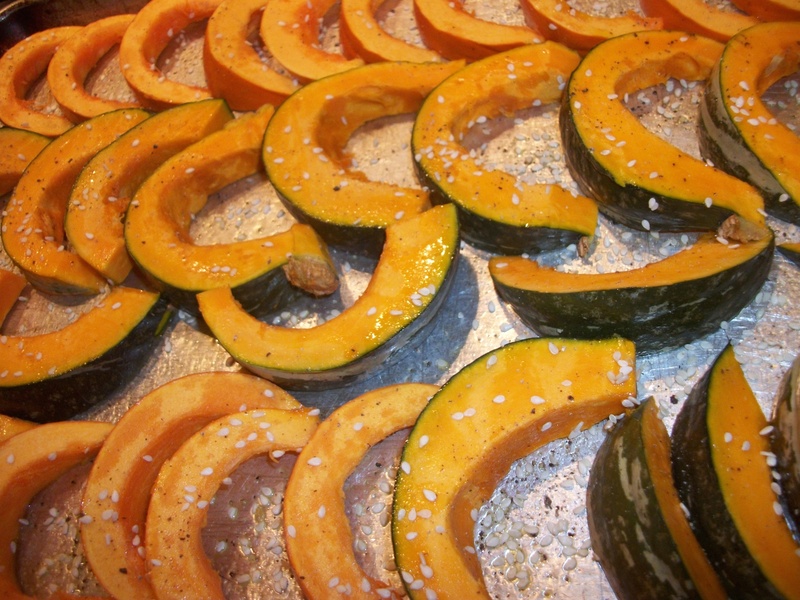 Halve a pumpkin or other winter squash. Scoop out the seeds. Slice each half into wedges about 1.5 cm thick. Place on an oiled baking sheet, flipping each slice once to make sure it’s coated with oil on both sides. Sprinkle with coarse salt, freshly ground pepper, and sesame seeds. Bake at 190°C (375°F) for 20-30 minutes.